Properties in Brick Landing Plantation Golf Club average 4.5 out of 5 stars. Property 4: 2 Br 2nd Row Coastal Cottage. Property 9: Another Day In Paradise! Property 11: Cute! Newly Remodeled Oib Cottage 2nd Row, 3 Blocks From Pier! Property 13: Charming and Clean Cottage! Property 18: Adorable, second row cottage with pool! Directly across from beach access point! Property 24: 'Unforgettable'! LOCATION! 4th FROM OCEANFRONT, OCEAN, SUNSET & SUNRISE VIEWS! Property 25: Sunset Beach Cottage with Deck and Ocean Views! Property 28: West End Rest and Relaxation! Property 29: Stunning Private Saltwater Pool! Ocean Views, Festive Decor! Delightfully Clean! Property 32: Pet Friendly Cottage On Sunset Beach. Spacious, Comfortable And Ideally Located! Property 33: Fully Renovated Second Row Cottage with Private Pool! Walk to Shops. Excellent Views from this 2nd Row Home with Beach Access Yards Away! Property 35: Excellent Views from this 2nd Row Home with Beach Access Yards Away! Property 37: Newly Renovated Ocean Front Cottage with Private Pool! Property 43: WILM 64 Bring your boat, relax and lose yourself to island life in this sporty cottage. Property 47: Beautifully-decorated, 3-bedroom Beach Cottage, Located On Sunset Beach Island! 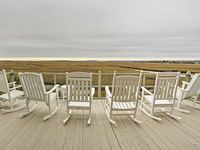 Property 49: WILM 9 This vintage cottage provides a peaceful atmosphere for enjoying the scenic marshlands. What a great place! Spectacular View! What a great place! Spectacular view and so peaceful and quiet Hoping to go back next May! The cottage was very clean &amp; nicely decorated. We enjoyed our stay at the cottage. It was a nicely decorated cottage. It had almost everything we needed. Close walk to the beach. Would definitely stay there again.